What is it about birdhouses? Why do we love them so and gravitate towards collecting them? and even buried in oceans of lush greenery. Needing actual trees for birdhouses is a notion from the past. They can be anywhere. 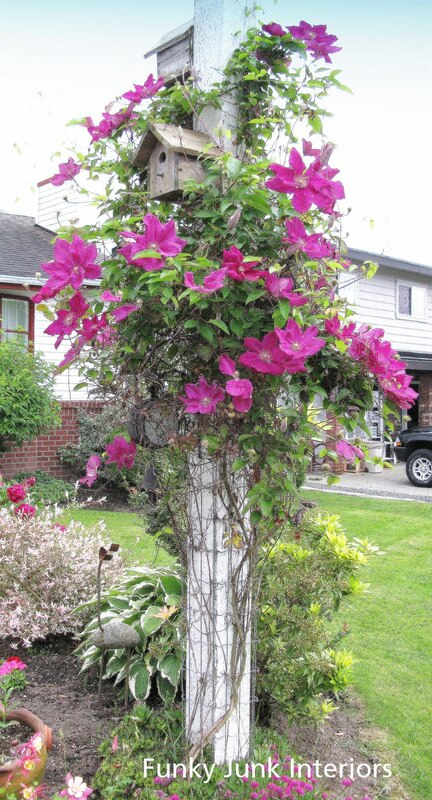 All it took here is having a white post, hugged by a beautiful clematis. This is my next door neighbor’s birdhouse sanctuary in their front yard and it is heavenly! As many of you that follow FJI know, things aren’t generally done normally around these parts. And even bird homes fall into that category. We had a nest that was in quite an unusual spot. And it allowed the best viewing opportunity EVER. Have you figured out where this nest is residing yet? … this. Needless to say, we hadn’t done much BBQing this year yet. Yeah well, a week or so passed when we came back to this little project and were finally ready to clean the BBQ out. Know what else came back? You guessed it. They’re back. We appear to run a new bird rental suite business. With the pay being, I don’t have to BBQ! Mr. Steak Eatin’ Guy is none too pleased though. 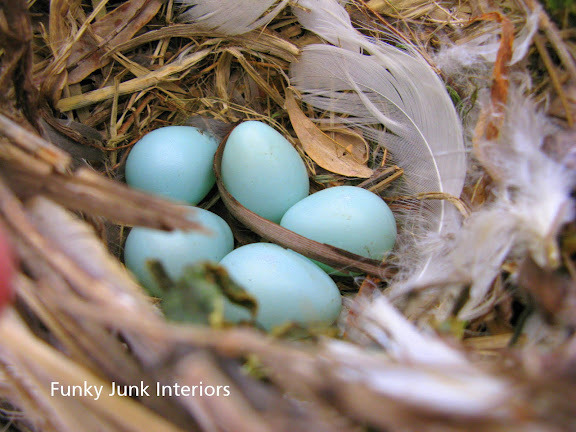 Where’s the oddest place you’ve ever found a nest? Awww! No steak for him! Ha! Wonderful birdhouses. I love the vignettes! What a funny story! I love your birdhouse collection, even the BBQ! 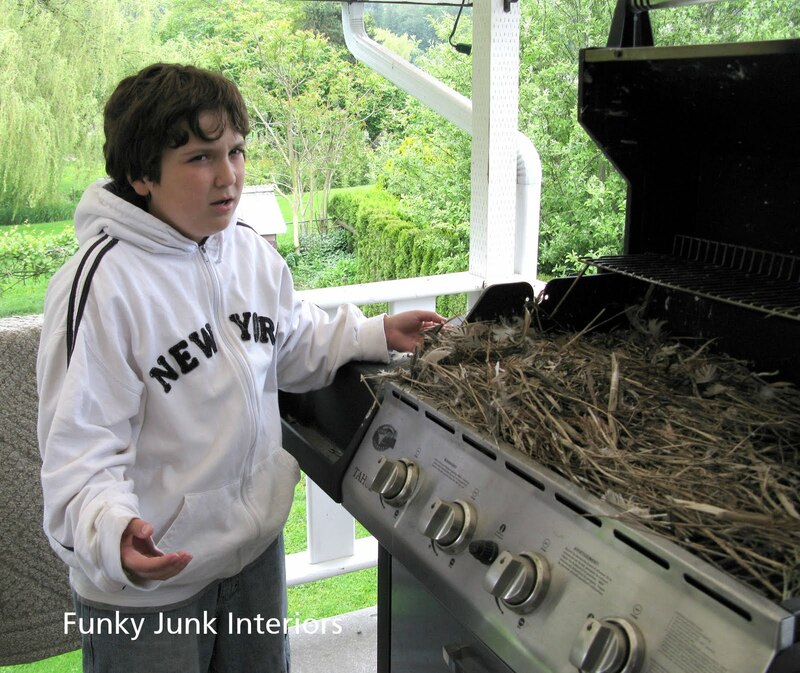 My family would not be very happy with your bird nesting grill either. We love to grill. I love birdhouses too and have several of them. What’s funny is people have all of these wonderful birdhouses and the birds choose something like your grill for their nest. They never choose one of the birdhouses. That’s a great picture of your son; his expression is priceless. That is too funny! Thank goodness you opened the grill before you started it! Adorable birdhouse’s , how crazy is that that they would make a nest on the grill !! But hard to give up the grill ! Oh how cool! Well, not so much for your son. I’m guessing there is an opening on the bottom? Can you tell I don’t grill much? I’ve had nests in my hanging fern, my garage and my sister had one in her house. She would leave the back door ajar for her dog. I believe it’s the Carolina Wren that will nest just about anywhere. Do you know what your little friends are? By the way, I am having a “struggling to pull the trigger” dilemma and would love some input on which flooring stain I should choose. Please stop by my blog and vote! Beautiful pictures of the birdhouses with the clematis & the nest!! Buahaaaa! Your son’s expression totally cracked me up. Priceless! So strange they keep going back to the BBQ! Yes, right on my front door in a grapevine wreath…when my son would come home the mama bird would fly out to scare him but wouldn’t to me:) I still have the wreath and the nest is still there! Amazing… I am embarrassed to say that in the first shot, I thought they were eggs bought at Michaels! So beautiful and what a spot to be found. That was so funny – but the same thing happened to us. We had company and when we opend the grill there was a small nest with the same color eggs inside. Of course, we couldn’t grill – we went out for dinner instead. I don’t know what kind of bird they are but they built a next inside my trucks tailpipe once – luckily we saw the grass sticking out before I started the truck, no eggs in it thank goodness. This has to be my favorite post of yours, I love bird houses too, and am hoping to find a few more today. I love the look on your son’s face in the last shot, priceless! 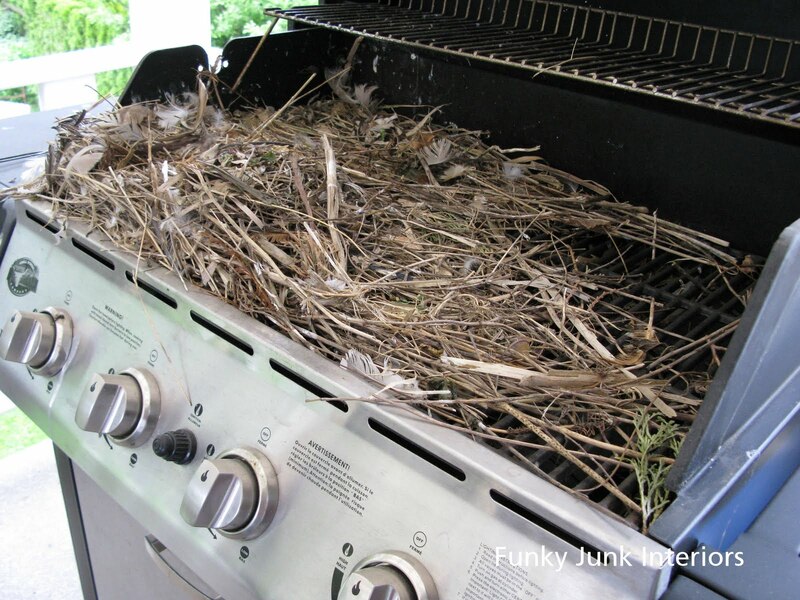 I never heard of a nest being built in a BBQ before! Can’t say it would happen here, as we’re BBQ’ing all year long. Oh my gosh, that is hilarious. Love all the birdhouses that you showed in the beginning, but yours is the best. A roof over their heads and central heating. How funny! Your son’s face is priceless :). LOVE your blog! This post is too cute. Wonderful pics of all the birdhouses. The swallows build a nest under the front of our pontoon every spring…we have to wait to go out on the lake until the eggs hatch. Love your birdhouses and your birdhouse grill. The same thing happened to my Sis-in Law this spring. 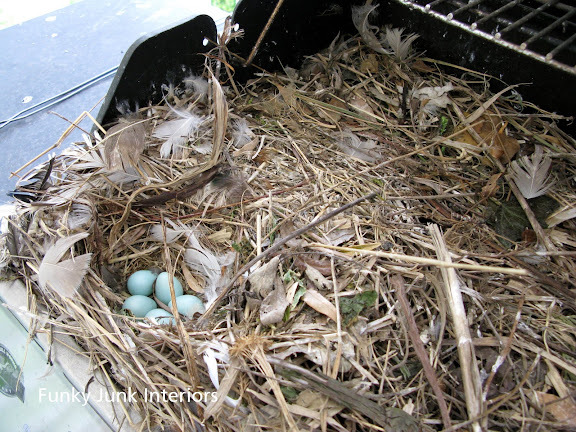 She saw straw sticking out of their grill and an entire nest with eggs was growing in it. Funny! Beautiful bird houses– and the look on your son’s face is great! He’s like? Love your inspiring garden love of birds. Come see my bird china birds, and older post of my Birdhouse I made. I build them and enjoy how peaceful they are. I forgot to take down a pine garland over my front door from Christmas and I had some house finches build a nest there and raise a family. Everytime we opened they door, they would fly off. I’m wondering if that is a bluebird nest because that is the color of their eggs and they will reuse their nest and have several “clutches” per season. But overall it looks too big and messy for a bluebird nest but I’ve only seen them in small nest boxes, not in a grill, before. Love your blog – have never commented before and have no blog of my own (no time – too busy reading everyone else’s). that’s hilarious! my hubby would not have been happy about that, either. hopefully they’ll hatch and be gone soon so you can enjoy some summer bbq! First I have to say the picture of your son made me laugh so hard! I can just picture my son doing the same thing. My hubby has been known to go grill a hotdog in the snow, so eggs in the grill would be torture for him too! 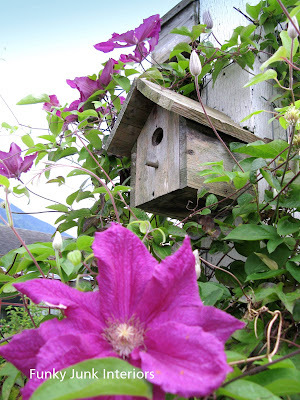 Second I love all the birdhouses scattered around your garden, so pretty! I finally pulled two birdhouses out of my garage and they are sitting on my patio. I feel so happy everytime I see them. What took me so long?! Great post! I have a love for all things “bird”. We do quite a bit of actual bird watching out our dining room window. Those eggs in the grill crack me up! 😉 It looks like robin eggs/nest. They tend to be messy nest makers, but build very sturdy nests. They can lay up to three times a season in the same nest. Looks like you may be off the hook for grilling most of the summer! Thanks for the laugh today! Too funny. My problem is that the squirrels keep ripping the coconut lining out of my hanging pots to make their own nests. 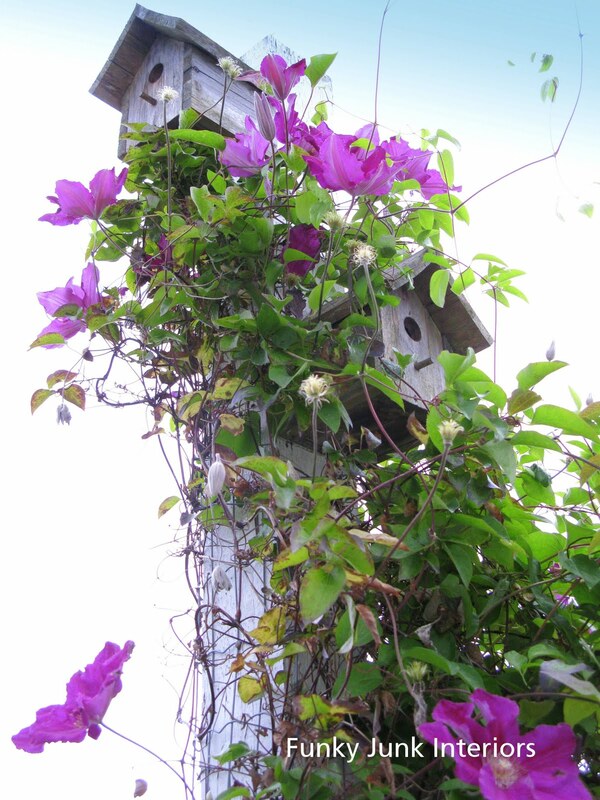 I like the idea of the bird house with the clematis. I’ve never seen a bird nest in a BBQ before…how funny! The nest and eggs are BEAutiful, though! Thanks for sharing all of this wonderful inspiration!! This is awesome!!! Your pictures were gorgeous too! My daughter and son in law would’ve been happier to find a bird nest in their BBQ, they found a mouse nest!!EEEKKKKK!!! I have a thing for birdhouses too. Love your collection! That is about the biggest nest I have ever seen! Is it a robins nest? Where did they go in, to get inside your grill? It is so funny that they nested in your grill! We had bees nesting in our grill, which is not quite as fun. I love the bird house on the bench. I think I would have to bring that one inside and use it as decor! Love your birdhouses! My dad loves them too. He makes these crazy birdhouses out of old barns and metal. He sells them when he goes to Hillsville, Va. Here is some of his birdhouses if you want to see them on my blog! blessings and thanks for the fun post. Maybe we are drawn to birdhouses as little girls are drawn to doll houses…..smiles. I have a mama bird and three babies tucked in a nest of pinestraw and horse hair (I live on a farm) inside my old galvanized watering can outside my back door. They were all pink and featherless when I first found them and are now all full of feathers and have their mouths open waiting for a snack every time I peek in at them. Too cute! The nest it just where I left it. Can’t throw it away. There is something very amazing about the design and utility of a birds nest. Too funny about the next in the BBQ. We use our way too often for something like that to happen (I think anyway lol). I love the birdhouses on the ladder and the wheel beind the plants. I am going to keep this in mind if I can ever get my garden to grow right. Can I just say, I’m giving Blogger the evil eye today. It messed up my spacing and preview doesn’t work any longer. Have you noticed?!? BAH! Anywhoo… the birds are coming and going through the back. I had no idea it was open there. Huh. Bees in the birdhouses.. oh my gosh YES. I was mulling around in the birdhouse garden and knocked one of them over. It landed on the ground and started vibrating with zzzzzzzzzzzzzzzzzzzzzzzzzzzzzzzzzzzzzzzzz. I don’t think I ever ran out so fast! Too funny about bringing the barn birdhouse inside. I already tried that. The next day I had bees covering my picture window. The next day more. Then it dawned on me. I opened up the bottom of the barn birdhouse and dropped it. Hives everywhere! Stop drop and run seems to be my middle name. I’m uncertain but I think they’re starlings. I haven’t seen a handsome robin by yet. #33 melody… mouse nest in theirs?!? GROSS!! #27 Arlene, first time commenting? Welcome!! Oh. And I need to use the cover on the BBQ soon too. Yeah. Soon! I know I’m not the first to say so, but I have to agree that the look on your son’s face after he discovered nest #2 is PRICELESS! A mama mourning dove has taken over the old robin’s nest in our cherry and is currently raising brood number two. Doves may be the only thing our cherry produces this year after our late freeze! Love the style! Love birds nests but hate cages! Freedom is everything! We have a bluebird nest in the newspaper box that is under our mailbox – I always feel guilty when going to the mailbox as the momma flies out, waits for me to leave then rejoins her family. Love all your funky junky stuff!! Yes Donna Blue Birds are just too funny! If your BBQ is facing North then, yes they will nest in the same BBQ next imte. I think that you need to get a blue bird house with a post and place it in your yard. They will be going to that one. I have three in my front yard and I clean mione out every three to five weeks. I am getting tired, but, they are so cute! Sorry but that post got me out of lurkdom and post a comment! That is hilarious! I would be shocked while DH would be annoyed. 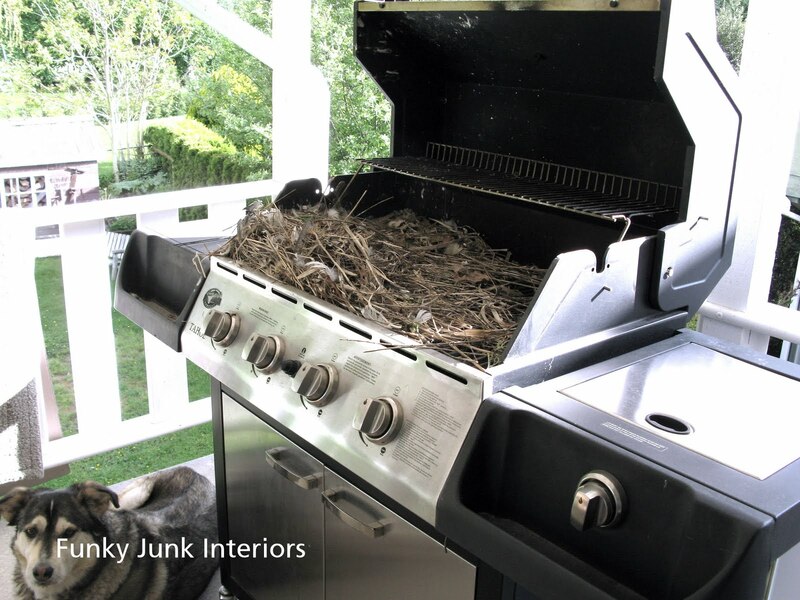 Now how in heck did that bird make a nest in a closed grill??? We did not use the front door of our house for an entire nesting season due to a bird family taking up residence in the Spring Wreath on the front door. Three batches of babies!!! This year no wreath so they are in my silk topiary and in the Akiba vine on the front trellis. Never mind the $100’s of dollars worth of bird houses I have bought…oh no! The best one ever was in one of my gardening boots.. sure wish I had gotten a photos of that.. it was so sweet! My sweet neighor has a nest in her grill.. they come in the side vent holes.. they have not been able to grill in 3 summers.. too funny!